The Writer’s Lens – Interview 09: Kay Smith, How Can Faith And Art Work Together? In case you missed it, I was fortunate to interview a fellow #CleCreative this past week, Kay Smith, where we primarily talked about the pressures of motherhood, work, and creative pursuits. Below is a link to the video interview on #YouTube as well as a short description about Kay and her work. Enjoy! Kay Smith worked for 13 years at a reputable marketing firm in Cleveland, OH. And though she loved her work, Kay began to feel something tugging her in a new direction. A tug strong enough to make her consider leaving her established career behind and start anew – in art education. But, it wasn’t a completely foreign space. Kay had always held a strong interest in art, even as a little girl. And with some proper coaching and encouragement early in life, she fostered that passion. Kay is a wife and mother of four children so leaving a steady job was not an easy feat. In this interview, I talk with Kay about her transition from her corporate office space to her new office space. And how her faith in God has enabled her to discover what it is that makes us all creative; how we can cultivate that creative spark; and ultimately use our gifts to help others. My freshman year of high school was a landmark in my life. I started the year with dyed blond hair. I ended it with brown. I started with no experience playing varsity sports. I ended it as our baseball team’s starting shortstop. I started with no braces and ended it with a consultation that would lead to braces (again). Lastly, I started with no girlfriend…and wait, I ended without one too. Okay, so it wasn’t a complete landmark experience. But, there was plenty happening that year. My friends, and especially my family, noticed the changes I was going through the most. Especially when it came to my outward appearance. I shot up about five inches. It was a much-needed growth spurt. For the majority of guys in my eighth-grade class had apparently been taking horse pills during the summer break. So I needed to grow. And thanks to father time, I’d been given the chance to do so. But, I’d also changed on the inside. I’d gotten more confident. I made decisions faster. I prioritized things. I even broke some rules that year. I stayed out later with friends. I took risks. And though it was uncomfortable at times, I was beginning to navigate who I was as a young adult. Writing is often seen as an outward expression of inner workings. The things that make us tick, boiling to the surface and out. How we feel about our world and what we think it ought to look like according to us. Ernest Hemmingway once said about writing, “All you do is sit down at a typewriter and bleed.” And there you have it – minus the blood. When I interviewed Darrick Dean, a fellow author, he and I were discussing how writers cand change over time. How even the most seasoned scribes like Stephen King can sometimes change their habits. How writers can alter their styles and even deviate from their core content (see my first book vs. my last). And though this can be true of the writing world, I don’t tend to stress about it. Style can change; much like a teenager in high school. The only thing I do want to concentrate on is my message; the themes I am engaging. The feelings I am leaving with my readers. This is something I want to have some consistency in. For I believe any great writer knows his words will outlast his lifetime. That he will be regarded (and remembered) by the messages he left behind. In my case, I can look back and see how I’ve changed; some ways more drastically than others. Yet, I must be aware that this is all part of the process. Finding a voice. Owning it. And being cognizant of how to utilize it. Every writer ought to be aware of this; every good writer, that is. Because even if you aren’t recognizing every little change in you, your readers most certainly are. Second, you could go to iTunes and find me by typing in The Writer’s Lens (also convenient and simple). And lastly, you can even find me here at my own website (most convenient). It’s all about accessibility nowadays, is it not? Wow. It’s been a while. Let’s get right to it. Being a sci-fi enthusiast, I found myself anxiously awaiting NASA’s big Mars announcement this week. I mean, come on, we’re talking about Martians here. Did we find’em? They out there? Every book that’s ever been written about the red planet would be turned on its head if so. But, as we know, that wasn’t the big news NASA had for us. Make no mistake though, what we got was still big news: flowing salt water. Water. Flowing freely. That’s pretty cool, right? I mean, water is a precursor for life. And though there are slim chances of a Mars shark or a Mars dolphin swimming about the water highways of Mars, there’s always that slim chance something with a heartbeat could be on the red planet. Right? Or as so many science fiction minds have imagined in the past: absolutely. From a literary perspective, Mars has been a source of inspiration for more than a handful of stories over the years. Perhaps most well-known is H.G. Wells’ War of the Worlds; one of modern literature’s first attempts at the alien invasion genre. First published in 1898 (hard to imagine), Wells’ classic detailed a battle between Earth and Mars’ inhabitants, the technologically advanced “Martians.” The book was received well and consequently influenced several other science fiction writers. Most notably, perhaps, was Edgar Rice Burroughs; the man behind the John Carter series, who wrote a series of books on Mars and his fictional race of people who lived there. But, that’s not all we got from Mars over the years. There was the trippy and engaging film, Total Recall, that took us to a Mars where people were trying to make the air on Mars “breathable.” Oh, and there’s mutant people in it, too. Then there was Mission to Mars, a film that tried to explain the theories of the universe through the eyes of highly intelligent alien life form (I guess that’s like having mutant people?). And there was the unfortunate box office flop, Red Planet, that tried to convince us of Martian “nematodes” that eat people. No mutants, just yikes. And for the less-than-serious takers, there was the satirical Mars Attacks! A film made to intentionally mock old school alien invasion movies while poking fun at its cast throughout. Jack Nicholson is in it. Pierce Brosnan is in it. Natalie Portman is in it. And so is… well, that’s all you need to know. Mars has been host to more than a few stories where alien life is bent on our destruction. And naturally, the general public loves it. Even if it’s coming from brother Mars. But, what about now? Does the discovery of flowing water change much? I’d be reluctant to say that it hasn’t. If nothing else, it’s provided even more inspiration for us Earthen folk. And with Matt Damon’s The Martian coming out this year, it seems like the timing couldn’t have been better. We may not be dreaming of terrifying tentacles or tripods with ray guns (well, not as much) but we do have that much more to work with. Ice miners on Mars? Rivers filled with Martian fish? As I said earlier, I’m eager to see what’s next. This month has been rough. I’ll just throw it out there. I’m officially four months in and this #12Months12Books thing isn’t getting any easier. However, I’ve been blessed with the opportunity to re-release this novella, Spirit, Run for the month of April. So here we go. A little about Spirit, Run, I wrote this story about a year ago and shared the majority of it on my blog. I’d say this was one of my first attempts to do something that wasn’t a full-scale novel. The entire thing felt like a contained story, one that could be told in fewer words than a big, overarching tale. I liked the concept and away I went with it. Ironic considering how appropriate I feel the title has become for what I did with it: run. Originally, Spirit, Run was just Spirit Run (hopefully you caught the change there). There was no emphasis added; no comma. I know it may seem ridiculous, but that added punctuation made all the difference. It turned the title into a command. As if the spirit is being ordered to run. That’s what I liked about changing the title. Rather than sounding like a linear tale, one that followed a specific track, it was now left with a greater deal of freedom. The main character, a spirit racing toward its human vessel, is commanded to run for its target. And it does so under the guidance of three angels; a trio of protectors battling on the soul’s behalf. However, they are unable to interact directly with the one whom they are defending. A real challenge considering the types of opponents they find themselves up against. As for what (or who) they end up fighting against, I’ll leave that up to the reader to find out. Spirit, Run will be available on Kindle Friday, April 24. Last Saturday, I was fortunate to be a participant in Cleveland’s Indie Author Showcase, as hosted by the Cuyahoga County Public Library. It’s the second showcase I’ve been to and was really a great experience. I took some photos, had plenty of visitors, and handed out lots of info on my latest works. It was a blessing, but also an opportunity to learn some things. For example, I had no idea you could fit so many writers in the same room (45 to be exact). The initial atmosphere felt like swimming in a shark tank. Thankfully, we all came out unscathed. And with some renewed faith in playing nice with one another, I’m sure. From a business perspective, having something to give out – like a brochure – was key. This may seem like a no-brainer, but when you’ve got books on your table, the thought of handing anything else out may feel like overkill. However, I’ve been to several trade shows. And I know that unless someone walks away with something in hand now, they aren’t going to remember you later. Doesn’t matter how intriguing you were, people need something tangible to hold onto. Especially if they’re seeing your product for the first time. I am glad to know I was prepared in that respect. And lastly, it doesn’t hurt to have friends come out and see your table (as evidenced by the candid below). These guys gave me some insights and ideas prior to the event too. That was invaluable – thank you again. Thanks to my fellow scribes, Paul and Immanuel, for coming out last Saturday. How to improve? More presentation and pricing. I had an adequate display, but found myself talking price quite a bit. Thankfully, my ebooks are relatively cheap – under $5 at the moment – but as my wife suggested, a pricing chart would be helpful for next time. And of course, have something in paperback. Currently, my work is all digital. I was the only person at the conference permitted who only had ebooks available (much thanks to the Library staff for letting me twist your arm and have me. I trust your elbows and shoulders are healing nicely). Their compliance was great, but after looking around and seeing the majority of tables packed with paperback and hardcovers, the answer was obvious: I should do the same. More on that as the year rolls forward. For now, it’s an onward march for name recognition – and reviews. If you happen to read any of my work, then please leave a review when you finish reading. I encourage feedback for a couple reasons. For one, if you’re willing to pay for it and read it, then I’d hope you’d be willing to leave some closing thoughts. Granted, no news can be good news – as people are more apt to share opinions when they feel jaded – but a good review can go a long way for the author. Thanks to those who have all ready! But, that leads me into my second reason: readership. I get emails, texts, comments from folks who read my stuff on a semi-consistent basis and though I appreciate it greatly, I want to encourage those same people to leave their thoughts on Amazon, my blog, or anywhere they can. Truly, the support goes a long way; reaching further than just a bank account, I assure you. There are some other thoughts I have on the showcase, but these were my initial decompressions. I’ll save the others for another post. Overall, it’s always encouraging to “get out of the think tank” and share your story with others. That was a major highlight last Saturday. As was having my wife help explain my work to others. Kudos to the Mrs. for being such a big help. 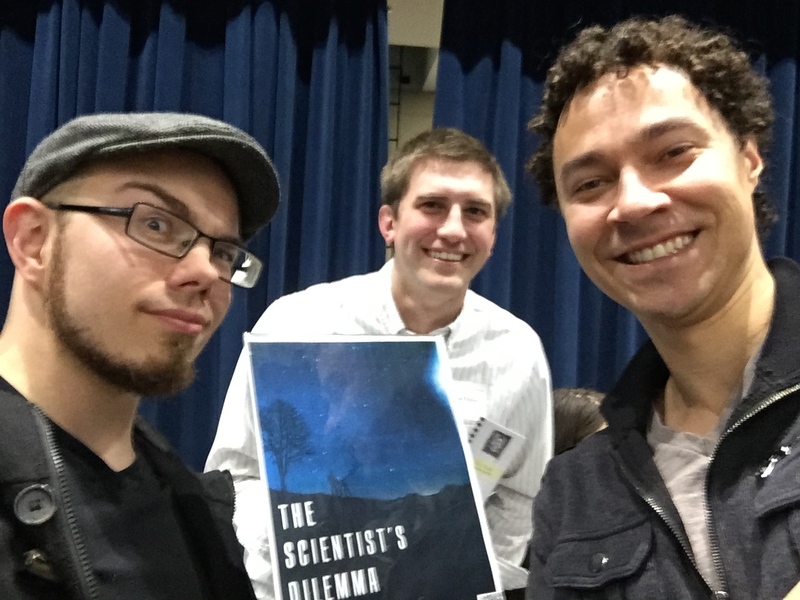 Finally, I’ll leave this post with my favorite question from readers who approached me: “So what’s your dilemma anyway?” (in reference to The Scientist’s Dilemma story). I had fun with that one, but another guy went so far as to ask me if I was formerly an astrophysicist. If only! I regretfully had to say, ‘not yet.’ That seemed like the most appropriate response.